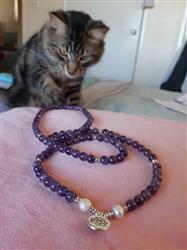 Enhance your intuition and spiritual consciousness with this Amethyst and Pearl Mala. Amethyst represents the Crown Chakra and helps to clear the mind of negativities and raises your hopes and self-awareness. This Amethyst mala facilitates meditation and brings a sense of spiritual calmness. It is said to be a ‘stone of peace’ that lifts the spirits and brings in hope. The two pearls mounted on each ends represents purity and innocence. The Lotus pendant represents the ability to be reborn and spiritual awakening. Consider the Amethyst Crown Chakra Mala if you want to spread peace, light and love within yourself and for all you come in contact with. Just love it.Was better then expected. Our family loves malas and these are nice ones. We got one for everyone, and wear them everyday! Definitely a keeper. Beads were great and the follow up was very professional. I have received many compliments on them. Will definitely purchase again.